The gentle Caribbean breeze on your face, the classic sound of a 60s Cadillac convertible, and the words “Guananamera, guajira guantanamera” playing on the radio as you pass through the historic avenues of Havana. If you’re planning your trip to the iconic land of Fidel Castro, there’s no doubt you’ll have pictured these scenes in your mind over and over again. Havana is the city of eternal summer. So put some patterned clothes in your backpack and get ready for some mojitos, Cuba Libres and stunning beaches, as you start to learn some Salsa steps on YouTube. Everyone gets caught up in the rhythm of the island, even those travellers who are a bit more reserved. For backpackers, this, the capital of one of the world’s last remaining socialist countries, is still a new destination and there a lot of surprises in store for those looking for adventure on the so-called “Isla de la Juventud” (the Isle of Youth). A walking tour is one of the best ways to get your bearings in Havana, better still if it’s free. A tour going through Habana Vieja (Old Havana) and Centro Habana lasts about two and a half hours on foot. There are lots of city squares around this area, each of them just as culturally significant as they are beautiful: Plaza de Armas, Plaza de La Catedral and Plaza Vieja. The walk also takes you past El Capitólio, Gran Teatro de La Habana and other sights, as well as hundreds of colonial-style buildings, which are enough to capture anyone’s imagination. For those who want to learn a bit more about the history of the city, this tour is essential! Free Tour Havana is pretty easy to find – just head to Parque Central and look out for people with red umbrellas. Havana by night is bustling. There are bars, music venues and restaurants on every corner, but one of the most amazing Cuban night spots is the FAC, or Fábrica de Arte Cubano (the Cuban Art Factory). It’s art gallery/bar/all-night party located in a former cooking oil factory, built in 1910. The party here has everything, ranging from art galleries with photographic exhibitions, a cinema, visual arts and paintings to dancefloors, restaurants, lots of bars and a big space for performances. The whole concept revolves around a wide range of Cuban artists, with a variety of styles, all in one place. The FAC has a youthful, cultural and positive energetic atmosphere, combined with really good prices. Entry costs about 2 US dollars. The Nobel Prize-winner Ernest Hemingway is a part of Havana’s culture. As well as being a great writer, Hemingway was known as being a heavy drinker, and his fame became entwined with two of the great bars he frequented regularly. These bars, La Bodequita Del Medio and El Floridita, form part of Cuba’s identity. With a heritage stretching back 75 years, La Bodeguita del Medio is home to the world’s best mojito, a cocktail that’s over 100 years old (and made with white rum, sugar, mint, lime and soda water). The space is incredible, with paintings and phots of the personalities who have passed through there, musicians performing Cuban music classics and for those with more of an appetite, one of the best restaurants serving Creole cuisine, food typical of Cuba. The slightly more sophisticated El Floridita is the home of the famous Daiquiri (made with rum, lime, sugar and crushed ice). The restaurant is really charming, and will inevitably give you the impression of stepping back in time. With its luxury antique furniture and waiters who will readily light the cigars of guests along with a bronze statue of Ernest at the bar, all of which will give you a flawless impression of Cuba’s golden age. Finally, we can’t say these places are cheap, but they’re worth visiting – at least for enjoying a drink in the bar. Cocktails cost around 6 US dollars. The biggest sofa in Havana gets its name from the fact that it’s one of the main meeting places for the city’s Cuban population. Street artists, musicians, people doing sport and, above all, lots of lovestruck couples, all find themselves scattered along an 8 km waterfront promenade linking Habana Vieja and Vedado. It’s worth taking a walk here at any time of day. However, I’d recommend going through Habana Centro and Habana Vieja during the day and then taking in Malecón in the evening! The sunset is breathtaking, and shows why this “sofa” is so loved by couples. For an even more cinematic experience, how about walking a little further to the famous Hotel Nacional and enjoy a mojito as the sun goes down. The Plaza de la Revolución is one of those tourist attractions that’s emblematic of a whole era. A spectacular building that shows the power of the government and its heroes. The square alone covers 72 million square metres, making it one of the largest squares in the world. It’s one of Havana’s most important sights. It was the place where, in the aftermath of the Cuban Revolution, Fidel Castro gave his epic speeches to millions of people. The José Martí Memorial is situated in the middle of the square, with a museum in its base and the structure itself standing at 100m high. It is a great tribute to one of the main people responsible for Cuban independence. On the other side of the square is the most famous sight in Cuba, the façade of the Cuban Ministry of the Interior, with a gigantic image of Ernesto Che Guevara. The Plaza de la Revolucion is one of those places you’ve got to visit, so you can show everyone that you’ve been to Cuba. Even if you’re not in favour of the government, a photo next to the figure of Che Guevara is something you’ll be able to look back on for the rest of your life! Do you know about this authentic Cuban experience? I don’t mean sitting in tourist bars or beautiful places in Havana. Cubans have rum bars, where you sit down, get a measure of rum or a “cerveza dispensada”- costing around 6 Cuban pesos, what a bargain! Strike up a conversation with the waiter or the person sitting next to you, watch a good game of baseball, the main national sport (and remember, the Havana’s team is the “Industriales”). It’s a cheap thing to do, something different, but it’ll give you a unique experience – being able to get to know the Cuban people in a simple setting where you can feel the essence of this country. However, the golden rule is not to go there in big groups of tourists. Rum bars are places for workers to relax after a day at work, not a sight for tourists! If you don’t have time to discover the rest of the island, with its famous beaches, such as Varadeira, Coco and Caya Santa Maria, then I’ve got a great tip for you: check out the beaches “of Havana”. The capital itself doesn’t have any nice beaches, however, about 30 minutes from Centro Habana you’ll find the “Playas del Este”, including Bucurunao, Tarará, Mégano, Santa Maria Del Mar, Boca Ciega and Guanabo beaches. When it comes to natural beauty, these beaches are on a par with those in more famous cities. Most people who go to the Playas del Este are Cubans (especially Santa Maria Del Mar – the most popular and most beautiful of all these beaches). This means that getting there isn’t very hard. The T3 bus goes there every hour and costs 5 US dollars (the ticket is valid all day), but you can also split a taxi for the same amount. Cuba’s modes of transport are already a big tourist attraction. Generally, these consist of vintage cars from between the 30s and 60s, in a wide range of styles and colours. This allows tourists to experience the dream of riding in a convertible along the Caribbean. The cars will take you wherever you want, even to other cities. It’s also common to see backpackers splitting a car between them to go on a trip (which is often cheaper than using the Cuban bus system. Another interesting Cuban vehicle is the Coco taxi, a type of motorbike converted so it can carry three more people inside a fibreglass coconut. It’s not hard to find either of these types of vehicles rolling through the streets, but they’re well worth the adventure! One tip is to always negotiate the price of the trip and, if possible, to pay the driver in advance! As you’ve probably realised already, Havana wasn’t a popular destination until recent years. This impacts the whole tourism infrastructure, including hostels. 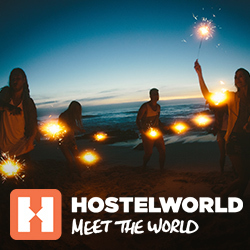 The great adventure of staying in a hostel comes from sharing experiences, meeting new people and making new friends. In Cuba, this experience is more profound. Under the country’s political system, people can’t have any large businesses, meaning that they transform their own houses into hostels (with everything being properly legalised and regulated by the government). As a result, you’ll experience a family atmosphere, in close contact with the residents, great storytellers who are open and lively! Located towards the edge of Malecón ini Vedado. The rooms are air conditioned. It’s in a really good location, near to restaurants, bars, cinemas and theatres. A large colonial house from the 1900s. It is equipped with air conditioning and located no more than 10 minutes from any of the important parts of Centro Habana. And they offer dance classes! Situated in the heart of Havana, the place was constructed in 1911 and has air-conditioning, hairdryers, safes and a minibar. As well as this, it’s located close to Havana’s free WiFi zone (and yes, this is very important! Internet access isn’t available everywhere in Cuba). I’m going to give you some tips and things to be careful of when visiting Havana. Don’t worry too much about violent crime, as the rates are really low. Havana does have cons and scams, but if you’re prepared you can avoid getting scammed. There are some really common ones, so I’ll tell you about a few of them here. Be careful when it comes to older people who say they took part in the revolution. They’ll tell you a story and then charge you a fee for it. A really common scam in Havana is the milk scam. You’ll be approached by a woman with a small child who’ll ask you to buy milk for her in the shop. Don’t buy it! The Cuban government provides free milk for children and the elderly. What really happens is that as soon as you pay for it and leave, she’ll return the milk and divide it with the person at the till. Another really common scam is the selling of Che Guevara coins. They’re worth 3 Cuban pesos and are sold to unwitting tourists in the street for 1 US dollar each. You could almost get 10 coins for this amount. It’s just a matter of being patient, they’re not rare and you’ll probably get some when you buy an ice cream. Always be wary of people who approach you and offer help out of the blue. Even though the Cuban people are really friendly and open, it’s better to ask for help in commercial establishments, hostels, from police and in tourist information centres. Pedro Biaso is a Brazilian journalist and a digital nomad who is passionate about roads, streets and bars. His sole aim is to recount everything he has seen. You can follow his adventures on his Instagram @pbiaso.